Charity matches and tournaments played a major role in the development of the game in Britain. Overlapping the era of friendly matches and the beginning of organised leagues, the footballing community prided itself on its donations to charitable causes, and indeed contributed more money to good causes than any other sport up until 1914. As the professional era crept in however, the 'charity match' slipped down the pecking order in footballing terms and in an increasingly commercial environment. 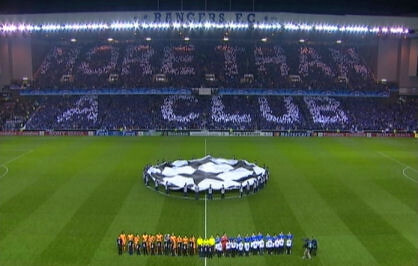 Rangers, since their formation, have participated in an amazing amount of matches for all sorts of good causes. Drill Hall Funds, Councillors' Poor Children Funds, Nursing Association Funds, Masonic Temple Funds, Catholic School Building Funds, Town Band Funds, Disaster Funds, Sanatorium Benefit Funds, Boilermakers Strike Funds, War Memorial Funds and Hospital Funds. Even The Lord Provost's Belgian Refugee Relief Fund to aid the 8,000 Belgians who fled their country at the onset of the Great War benefited from the charitable nature of Rangers Football Club. That the club, even in its infancy, was able to draw a sizeable crowd meant that a Charity match involving the Light Blues meant a crowd whose pennies and farthings swelled the coffers with admission money and rattled the collection cans in a charitable fashion. As well as much needed money being raised for good causes, it also gave the teams a chance to actually play some football, given the fact that there were no leagues or a regular match schedule in the early days. It was a win-win situation for all involved, especially if there was a one off trophy up for grabs to add prestige to the occasion. It was in the name of Charity that a fledgling Rangers team won their first ever trophy, The Glasgow Merchants Charity Cup. Conceived during the 1876/77 season in the hope of healing a rift between Scotland's premier team at the time Queen's Park, and Vale of Leven as well as raising money for good causes, Glasgow Merchants put up a trophy and invited both teams to contest it. Vale of Leven remained in a sulk and refused the invitation! Rangers were invited as Scottish Cup Finalists and played in the first Glasgow Charity Cup Final in front of 10,000 spectators, and promptly lost 4-0. It didn't take long, however, for the clubs first silverware to be heading to the trophy cabinet in the Kinning Park Ground. The same competition in the 1878/79 Season saw Rangers defeat Third Lanark 4-1 in the semi- final, and then Vale of Leven 2-1 in the final at the first Hampden Park, on 20th May, 1879. A historic day in the continuing history of our club, it was the clubs only trophy in the first twenty years of its existence. Of the four young lads that had a dream, Moses McNeil and Peter Campbell played in that first final. Eminent Victorian writer and sports historian, H. H. Bone wrote of Moses McNeil's performance, ' ...the youngest of a famous football family, he was quite a boy when this cup tie came off, and played with a dash and finish on the left wing that completely astonished all who were present at old Hampden Park that May evening.' Of Peter Campbell, whose medal can be seen below, he wrote, ...was the life and soul of the forward division and it is not too much to say that it has lasted better than will our contemporary writing.'' 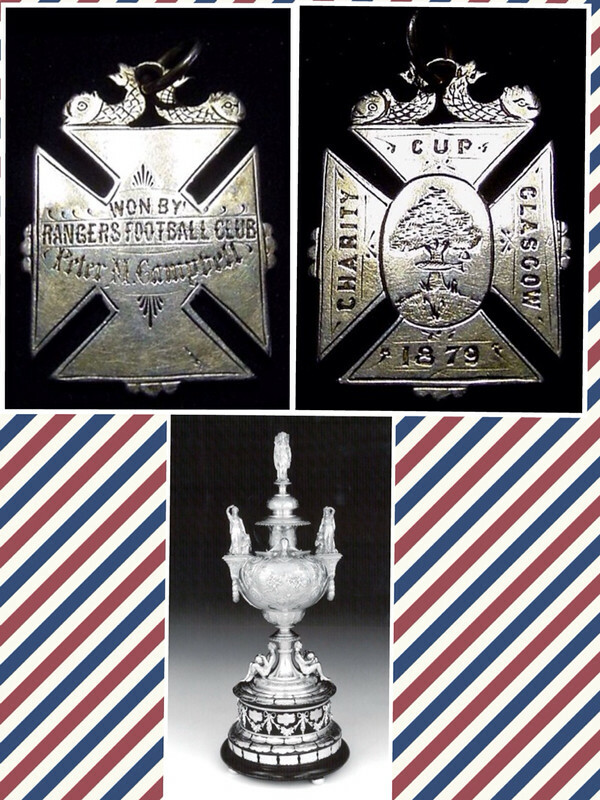 The Charity Cup was contested until 1966, with Rangers lifting the trophy the most with 32 wins. Sweet Charity! One of the first Charity matches played by Rangers was on 31 July, 1883 at the Kinning Park ground.It was organised to raise money for the dependants of the 'Daphne Disaster.' A couple of weeks earlier on Glasgow Fair Friday, the ship 'Daphne' was launched at Alexander Stephen's Linthouse Shipyard on the Clyde. The ship overturned on its Port side immediately after its launch, sinking it in deep water with the loss of 124 men and boys, most of their relatives watching on in horror from the riverside. Rangers moved swiftly to set up a Benefit match with Scottish Cup holders Dumbarton. A 4-2 victory for Rangers saw £63 8s 6d raised for the relatives of those who lost their lives in the tragedy. The first and by no means the last time Rangers would give their generosity and time to boost fundraising efforts for communities which had suffered from tragedy. 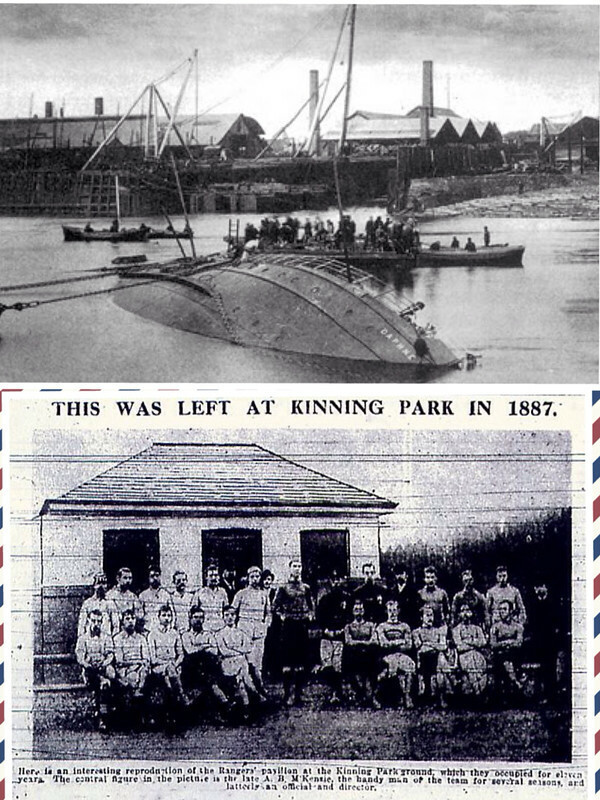 The 'Daphne' lying in the Clyde, and Rangers at their Kinning Park Pavillion. Rangers also helped out in the local community by playing a match for the Kinning Park Unemployed Benefit Fund on June 2, 1886 v Crusaders. 'It is impossible to do justice in mere words to the spontaneous generosity shown not only by Scottish clubs, but by the Football Association and the Football League of England, and by individual clubs south of the border. From far off South Africa, Scottish 'exiles' who had loved the game when at home and who who love it still, sent contributions. During the remainder of the season, the energy of the Rangers executive was devoted more to organising relief than to winning matches'. And organise Relief they did. 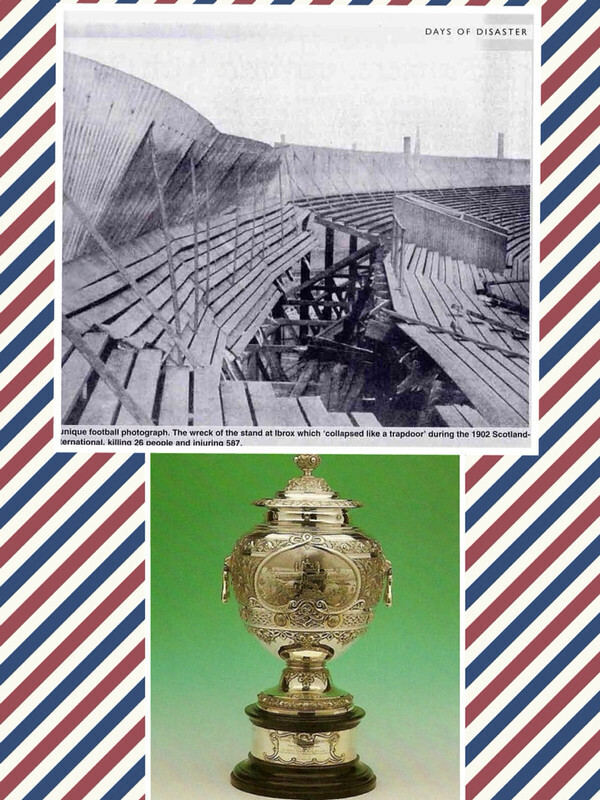 Rangers offered their unique 'Glasgow Exhibition Cup' (which they had won earlier in the season as part of the Glasgow International Trade Fair of 1901) up for competition, and the Ibrox Disaster Fund Benefit Tournament became the first and only British League Cup, featuring the winners and runners up of the Scottish and English Leagues. Celtic beat off Rangers, Sunderland and Everton to win and keep the Cup, which I believe is on display in the Celtic Trophy room. Rangers directors expected the Cup back at the end of the season, however Celtic refused stating they had won the cup in an officially organised tournament. Lawyers letters were sent to and fro with both Clubs claiming rightful ownership. Celtic never returned the cup. Incidentally, the Cup is inscribed 'Won by Rangers F. C.' A classic Pub Quiz Question was born, 'Which one-off trophy has been won by both Rangers and Celtic!' Time for another letter to sent, Mr. Green? The scene of the first Ibrox Disaster, and Rangers 'Glasgow Exhibition Cup', won by Celtic in the Ibrox Disaster Benefit Tournament and now 'in custody' at Parkhead. 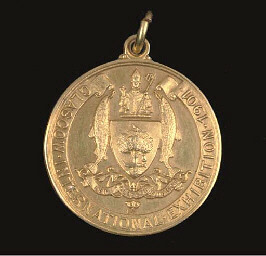 18ct Gold Winners Medal from the 1901Glasgow Exhibition Cup. The back is inscribed, 'Sports Section, Exhibition Cup, Won By Rangers F.C.' It was sold at auction in 2006 for £504. Those who carelessly link Rangers to 'Uber-Protestantism' from their early history may be surprised to learn of the Leith Catholic School Building Fund Benefit Match. Not a match played by our separated brethren from the East, but a Benefit Match where Rangers played Hibernian to raise funds to build a catholic school in Leith. Persuaded by a Father Callan, Rangers duly obliged and on 5th May, 1903 Easter Road was the venue where a 2-2 draw was played out. Torrential rain kept the attendance to 500, the lowest recorded for a Rangers v Hibs match at Easter Road. 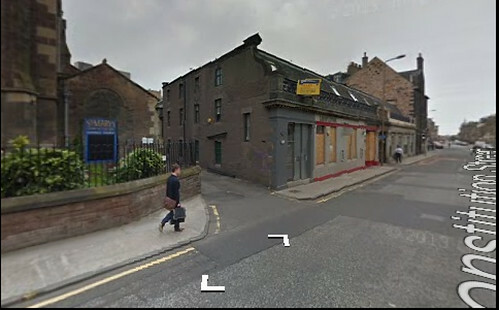 The catholic school- partly funded by Rangers- still stands today on Leith's Constitution Street. The Catholic School building partly funded by a match involving Rangers is said to stand next to this church on Constitution Street. I'm assuming this is it, as there stands a Housing Authority building on the other side! Later that month, a Rangers team played a Lanarkshire Select in a benefit match for the Motherwell Masonic Temple Fund, and lost 4-3. In the same vein, a benefit match was also played in April 1912 v Ayr Utd at Somerset for the Troon Navigation Lodge No. 86 Building Fund, Rangers running out 7-2 winners. The Grand Orange Lodge of Scotland also came calling, and a game v Partick Thistle in April 1915 boosted their Hall Building Fund. 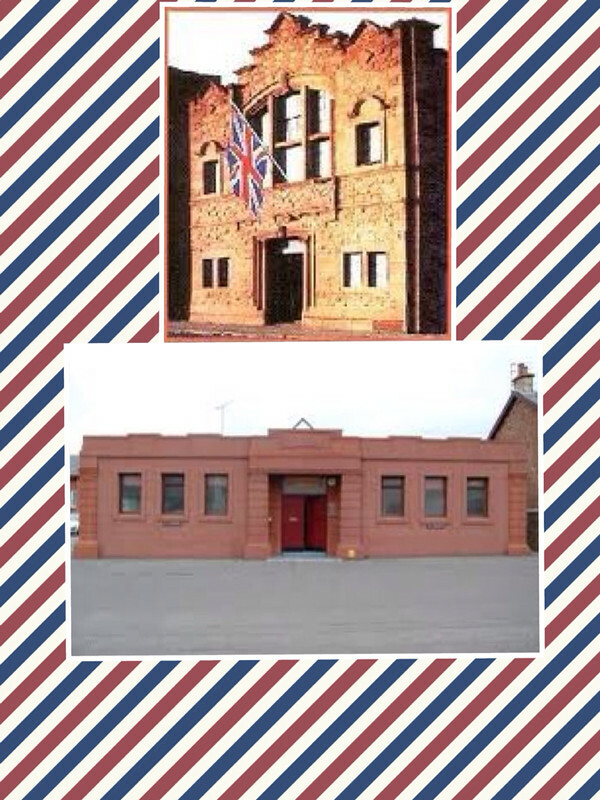 The Grand Orange Lodge of Scotland Hall and below, The Troon Navigation Lodge No. 86 Hall, partly funded by Rangers charitable spirit. 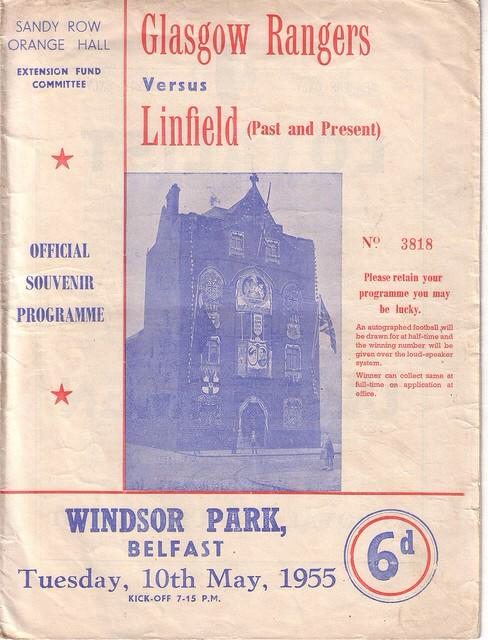 Some years later, a benefit match was played in Belfast, against Linfield on May 10th, 1955. The purpose of this match was to raise funds for the Sandy Row Orange Hall. Rangers took over a strong team and won 2-0 with goals coming from Waddell and Hubbard. As the program shows, it was a Linfield team made up of past and present players. The years of the Great War saw Rangers ramp up their charitable deeds in aid of the home war effort. There were matches played for the benefit of the Red Cross War Effort including a game v the British Army in April 1917, a game v Everton for the St. Dunstan Hospital for Blinded Servicemen and a match to benefit the Red Cross & Soldiers Comfort Fund. In May 1920, Rangers crossed the Firth of Clyde to Arran to play an Island select in a match to aid the Arran War Memorial Fund. A 4-0 victory is the only information I can gather on this match. 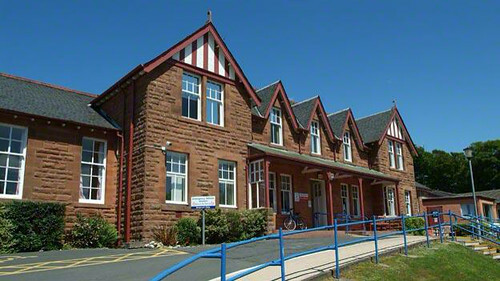 The Isle of Arran War Memorial Hospital in Lamlash was raised on the suggestion of the Marchioness of Graham (later to become The Duchess of Montrose) as a fitting memorial to those who gave their lives in the First World War. It was built, equipped and maintained by voluntary subscriptions, and as such, the hospital is the War memorial for the Isle of Arran. In more recent times, Rangers sent a team to Gretna on 9th January, 1989 for a Lockerbie Disaster Fund Benefit match, losing 2-1. The above matches are but a very small selection of matches played by Rangers to benefit others. I have omitted any benefit matches played for players over the years, as you can imagine there have been a few, especially in the early days when players didn't make enough money out of the game to retire with a handsome pension.